Torn Halves: A philosophy of EFL? In the post today I got an invitation to the International Publishers Exhibition in Athens and a free copy of one of the Mary Glasgow magazines. The exhibition is a kind of conference, and I see from the programme that there are 31 talks. 14 talks deal specifically with exam preparation. Talks dealing with classes at a lower level tend to emphasize things like "fun activities for juniors and seniors," and "exciting" materials for A-C classes, although the excitement there seems to centre around new technology like the whiteboard. One talk title mentions teaching methods, but it is actually about how to use interactive e-books in the classroom, not about methodology as such. Another talk is about how to make education more "effective", reducing "teaching sessions to only two periods per week". Only one talk mentions the word "philosophy", but the subtitle is: "a totally new philosophy for preparing students for all higher level English language certificates" – clearly not much philosophy there, though. Someone with a more thoughtful approach to the business of teaching English has to wait for the last (the 31st) talk given by Cliff Parry from the British Council – a talk entitled "Values in Education", looking at teachers as "models of values" and asking the question: "What are values and how are these reflected in the classroom?" I want to go to that talk (and only that talk), and I find myself wondering if it is entirely a coincidence that Cliff was sent to the back of the queue. Did he do something wrong? Let's have a quick flick through the Mary Glasgow magazine. Now, I just assumed that Mary Glasgow was ever so slightly radical. Hence my disappointment on flicking through the magazine (bearing in mind that this is the Crown magazine, aimed at pre-intermediate level). 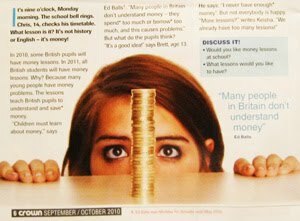 Cover topic: money, illustrated with photos of Bank of England notes that have the faces of smiling kids superimposed on them. Plus a star: "Britain's top tennis star, Andy Murray". Page two: a photo of Lisa looking happy in her bedroom surrounded by her collection of 12,000 Pokemon toys. Page three: pumpkin lanterns with faces carved out of the skin – the five faces being those of four famous Hollywood actors and actresses plus the singer, Madonna. Past the two-page spread about Britain's top tennis star onto page six, which is about money, with more photos of children smiling out of Bank of England notes, supplemented with a big photo of a tall pile of pound coins with the face of a girl in the background staring anxiously at the top of it almost as if it were some sacred totem pole that she must pay homage to. Then flicking over to page seven where there is a piece about a rap star and how he became rich. Following that an interview with a "real British teenager" talking about his pocket money and spending habits. After the English coach clarifies the correct preposition to use when telling the time, we have another double-page spread, this time about Cheryl Cole, who wasn't good at school but who became famous as a singer and talent show judge. The two last pages are almost in black and white, and tell us about the "amazing life" of Florence Nightingale. 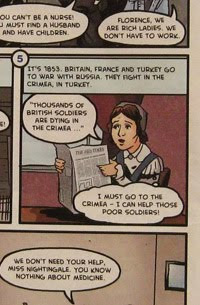 In one of the frames from the cartoon we see the compassionate Florence reading about thousands of British soldiers dying in Turkey and saying: "I must go to the Crimea – I can help those poor soldiers!" She is appalled by the conditions in the makeshift hospital. "Come on ladies. We must feed these men good food. We must dig toilets. We must wash the floors. We must open the windows," she says to the other nurses. After all those stories about people becoming rich and famous, and photos of people smiling out of banknotes, and all the concern about money and what to spend it on, I wonder what sort of impression the story about Florence Nightingale might make on a young mind. It's the only story in the magazine about anyone who actually does anything good. It's right at the back of the magazine. The colours are all sepia tones, and the story is about a woman who has been dead for a century. There are some pretty powerful and rather dubious subliminal messages there. Part of the message comes from the juxtaposition. 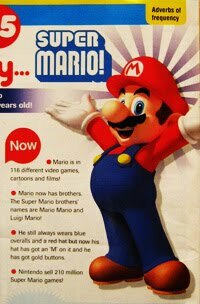 For instance, children closing the magazine after reading about the "amazing" life of Florence Nightingale, thinking perhaps about how thin and underfed she looked, or wondering if they could ever bring themselves to dig toilets in Turkey, can't help but notice the back cover, which is devoted to sending multi-coloured birthday greetings to Super Mario – "a famous video character". The huge gaudy photo of the obviously well-fed Super Mario must surely obliterate the pale memory of Florence Nightingale in the minds of all but the most sensitive children. Perhaps Mary Glasgow seemed quite radical back in the 1950s. According to the Wikipedia entry about her she proposed "abandoning the whole apparatus of grammar, replacing it with a simple course in conversation, greetings, courtesy phrases… with songs, cross references to cookery, sport, geography, railway posters and fashion." Although railway posters haven't caught on as a foreign language teaching aid, Mary Glasgow's more general approach to producing "fun" learning materials has now become pretty much mainstream. What does this have to do with a philosophy of EFL? What I want to suggest is that we might be able to appreciate the need for something like a philosophy of EFL by reflecting a little on, for one thing, the materials we are using and the subtle messages they might be conveying. If this magazine is anything to go by (and I admit that a sample size of one is a bit limited), by handing out Mary Glasgow materials we are lending support to a mindless celebrity culture. Unwittingly perhaps at first, we are promoting those values, going from one activity to another centering on the lives of the rich and famous. If we are not happy about promoting those values, then we need to start thinking about what values we should be promoting, and that is the kind of thinking that would lead to what would be called in everyday language a "philosophy of education". But we don't have to begin by looking critically at teaching materials. We could begin by taking another look at things like seating arrangements, whether we encourage students to work on their own or in groups, how we praise and assess them, the way discipline is imposed, etc, etc. There is lots to be discussed here, and in a two day conference with 31 talks it is a topic that deserves to be discussed in more than one of those talks, and it is definitely not a topic to be relegated to the final talk, when lots of people are probably a bit tired and anxious to get off home. Does it matter if we don't have a philosophy of education, and if we leave before the Cliff Parries of this world have had a chance to speak? Yes, it matters massively. There is absolutely no hope for society if the educators allow themselves to become unthinking cogs in the commercial machine. 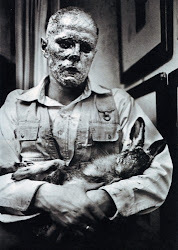 Perhaps I am seeing things too bleakly, but my impression is that things have sunk so low that I am cheered just to see that someone has a bit of a philosophy – it really doesn't matter what sort of philosophy it is. Any old philosophy – as long as people are thinking about it and discussing it – is way, way better than the current intellectual self-abnegation on the part of teachers. Progressives believe that "the teacher should try to arouse student interest and motivation through the use of student centered activities and interests in the classroom. The curriculum should in no way be prescribed and should come from the "interests and needs of the students." It should in no way be imposed upon students from above." Now the reason why we are called Torn Halves is because the world is full of stuff that is torn in half, and the progressive concept of education is no exception. Of course, we must try to arouse student interest and motivation and work with students as they are, with all their strengths, weaknesses and idiosyncracies, but we must also insist – and find clever ways of getting this across as much as possible – that there are things – values – more meaningful than the bling of pop culture, with all the greed, manipulation and profiteering that goes on behind it. We must insist, for instance, that Florence Nightingale gets put somewhere near the front of the magazine, if not on the cover, and when someone suggests we include a fat, happy Super Mario, we tell them very firmly that Super Mario has no place in the English classroom. We don't object to children whiling away a little of their freetime playing mindless video games, but lets not create the impression that the virtual stooge in a plumber's overall has any right to stand shoulder to shoulder with Miss Nightingale. The progressives would be more in the right if students arrived directly at the school from lots of little houses on various prairies, each bringing interests and needs that are genuinely their own. That is far from the case. Children arrive with interests and needs deviously whipped up by cynical marketing managers dangling gaudy baubles in front of them. Teachers need to see the school (as I am sure most of them do) as a refuge from the barbarism of commercialism, and their work as an antidote to the pernicious nihilism of business. In such a context it is equally important to have a clear vision of what we ought to be doing, instead of just letting the kids carry on running after those gaudy baubles and patting ourselves on the back for being oh-so child-centred. Another word for that sort of clear vision is: "philosophy". A wonderful blog post! I was thinking the same thing about the IP Exhibition while I was flipping through the programme. Is it worth going all the way to Athens (travelling isn't easy when you live on an island)for this ? Cliff's talk was the only one I was really interested in! So as you can guess, for practical reasons I could not attend. I'm glad that more and more teachers are expressing their opinions about the material (and messages) we give our students!! Personally I don't want any more rich n famous pop stars in course books !! We all wonder why students are not fond of reading but never stop to think that it might be our fault. Cool graphics and celebrities don't make a good course book and learning is not just about vocabulary and grammar... let's not forget values !! Thanks for the expression of solidarity, Smaragda. I remember when I was learning French at school a long, long time ago. We had one textbook which was only illustrated with black and white drawings of a mind-numbingly tedious suburban French family. I certainly don't want to go back to anything like that, but there must be an alternative that doesn't involve teachers becoming pawns in a game that ultimately has nothing to do with education, civilising people or raising standards. PS Personally I have fond memories of reading about "la famille Bertillon" in French classes all those years ago, but that is pure nostalgia. They were, in truth, pretty boring. James, I am surprised you remember the name of the Bertillons. My memory fails me so I can't say whether or not you and I, in our different sub-urban schools, were reading about the same squeaky-clean Gallic family. Storming the conference? Mmm. You touch upon a very timely issue. Stay tuned because I will be dealing with that in the next post, which is actually about a beach, but deals in passing with things like storming conferences, council halls, parliament buildings and the like. At this critical historical juncture I feel we need to clarify where we stand on such issues. Another great post! What else can I say except that I thoroughly agree with you... This is one of the reasons adult classes enjoy your books: they constantly have to rethink and question things they had taken for granted without any imposition stemming directly from the book. So thanks for all the food for thought you give to us through blogging and book writing! as emphatically as they should, in a world where money is often considered the top 'value'. It seems to me that the habit of thinking should become trendy again(after all,you don't spend a penny in order to think ,so it's 'affordable' during a financial crisis period). I teach english(believe it or not)but I've always tried not to limit the lesson in grammar explanation only.Some pupil's mothers were angry with me for doing so.Never mind.I hope,gradually,people will remember there's nothing as worthwhile as growing strong,steady feelings in their souls and dare to express them.And if this doesn't happen up to a large scale,we still have to struggle for what we've put our faith upon. This post is very well written and I agree that most teachers, and language schools in general, need to take a more philosophical and holistic approach to teaching. HOWEVER, I believe it is very idealist and not very realistic to eliminate commercial products and pop personalities from the classroom. English schools work because they are businesses above all else. @cthuntley Slavoj Zizek gave a talk not too long ago in which he argued that we should be demanding the impossible. If that is idealism, then I am a passionate idealist. If, as educators, we are bringing up people to be interested in just two things: business and pleasure (or work and play), then we have failed.